The Second Congo Civil War was the struggle to overthrow long-time Zaire President Mobutu Sese Seko by Laurent-Désiré Kabila, the leader of the Alliance of Democratic Forces of the Liberation of Congo (ADFLC). Kabila initially had the support of governments in neighboring nations including Angola, Uganda, Rwanda, and Burundi. 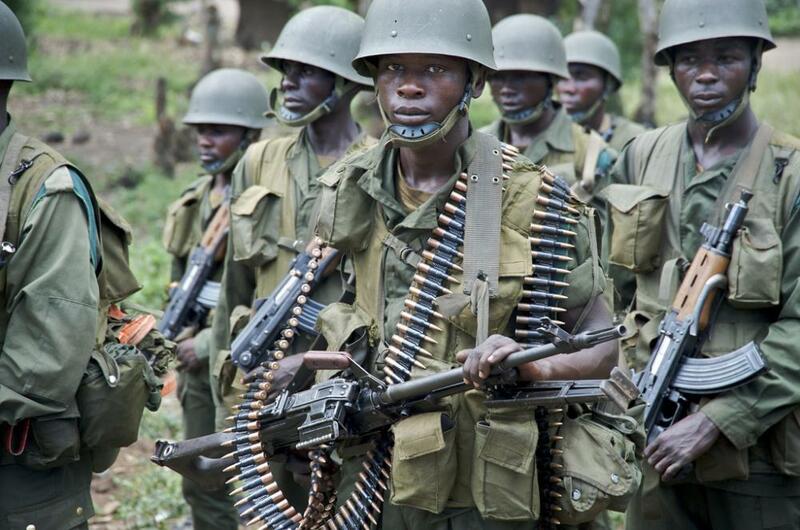 During the year-long conflict an estimated 250,000 were killed in the Congo and neighboring nations. The origins of the Second Congo Civil War date back to 1965 when Mobutu, with the support of the United States, became the President of the Congo, whose name he changed to Zaire. A staunch anti-communist, Mobutu supported opposition movements to Communist or leftist governments in Angola and Zimbabwe and opposed the African National Congress (ANC) in its efforts to take control of South Africa. In the early 1990s, a wave of democratization swept through Africa. In order to keep power, Mobutu promised reforms. Meanwhile in neighboring Rwanda, the genocide against the Tutsi ruling minority led Mobutu to support the Rwandan Patriotic Front which battled the Hutu leaders. In the chaos, two million Hutu refugees fled Rwanda for Zaire after the Rwandan Patriotic Front took over the country in July 1994. Among some of the refugees were members of the Interahamwe, the group largely responsible for the Rwandan Genocide. The Interahamwe set up camps across eastern Zaire from which they attacked Rwandan Tutsis and the Banyamulenge (Zairian Tutsis). Mobutu supported the Interahamwe extremists for political reasons and did nothing to stop the cross-border violence. In November 1996, the vice-governor of South Kivu Province, Benjamin Serukiza, ordered the Banyamulenge to leave Zaire on the penalty of death. In response they erupted in violence. The ADFLC used this uprising to launch their own campaign to overthrow the Mobutu regime. The AFDLC quickly gained support from Paul Kagame, the President of Rwanda, Yoweri Museveni, the President of Uganda, and Jose Eduardo dos Santos, the President of Angola. As Kabila and AFDL rebels marched west toward the national capital at Kinshasa, many in the Zairian Army joined them. In December 1996, the AFDLC had its first significant victories when they took over towns and mining districts along the eastern border of Zaire. Yet there were already reports of massacres and other atrocities by the rebels. In 1998 a United Nations human rights investigator claimed that 60,000 civilians were killed by the AFDLC during its campaign to unseat Mobutu. In March 1997, the AFDL launched its major offensive toward Kinshasa and demanded that the government surrender. On March 27, 1997, the AFDLC took over the town of Kasenga in central Zaire. On April 2, 1997, Etienne Tshisekedi, a long-time rival of Mobutu, became Prime Minister. Mobutu put him in the office to try to create a coalition government to resist the rebels. Nonetheless on May 16, 1997, Kabila and his army took control of Lubumbashi, the second largest city in Zaire. Upon seeing his power crumble and suffering from prostate cancer, Mobutu fled the country. He died on September 7, 1997 in exile in Rabat, Morocco. Laurent Kabila and his followers took control of the government in Kinshasa. He named himself President and renamed the country the Democratic Republic of the Congo, its pre-Mobutu name. Once in power Kabila was accused of corruption and authoritarianism. In August 1998, he turned on his old allies, the Tutsis, dismissing them from all government posts and ordering all Rwandan and Ugandan officials to leave the nation. The two countries responded by sending troops to support a new group of rebels intent on overthrowing Kabila, which initiated the Third Congo Civil War. “Second Congo Civil War,” Academic, http://enacademic.com/dic.nsf/enwiki/637019; “Second Congo Civil War,” Enough, https://enoughproject.org/blog/congo-first-and-second-wars-1996-2003; Tom Cooper, Great Lakes Holocaust: First Congo War(Solihull, England: Helion and Co, 2013).